First dances are often the first chance a couple has had to be alone with each other after the actual ceremony. It's always a moment full of emotion and love, and we work hard to capture all of that without intruding on the couple's togetherness. As wedding photographers, we always are aware of just how to capture emotion without becoming part of the scene ourselves. Long lenses, inclusive composition, all of this is part of the process. 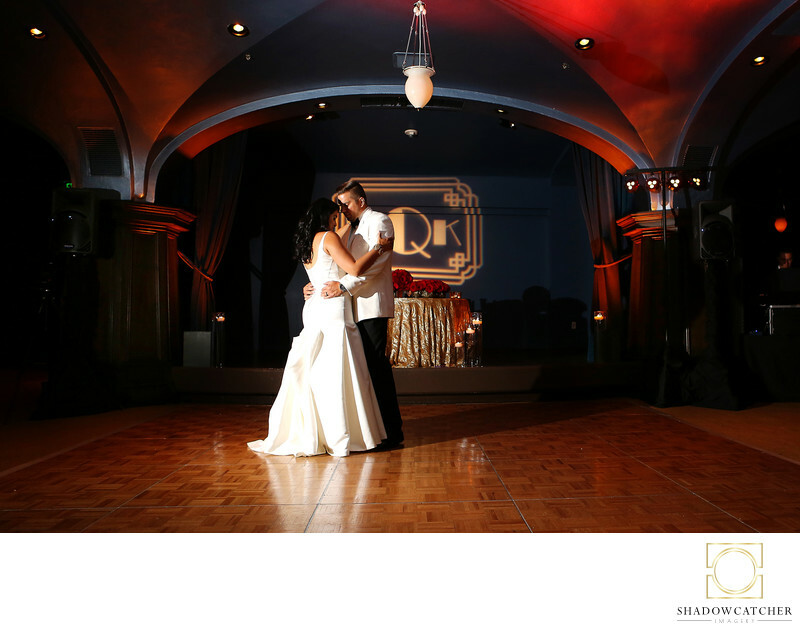 Veronica and Kimo had a very Gatsby themed wedding in a former speakeasy in the basement of one of San Diego's oldest and finest hotels, the US Grant Hotel in the heart of Downtown. The lighting there was gorgeous and we balanced our camera's flashes to bring in as much of that ambient light as possible. Here, we've put a flash off to camera left and turned the flash on the 5D mkIII down to barely contribute any light at all. This heightens the drama of the image and also shows the beautifully lighted arch framing the couple. The Canon 24-70 f2.8L lens used in this keeps the image sharp and adds to the ability to get as much ambient light as possible.